This is a great recipe for the month of Ramadan. It is an Egyptian dish. Bake in a clay baking dish if. In absence of that, any deep baking dish is fine. Heat olive oil in a large saucepan over medium heat; cook and stir onion until translucent, about 7 minutes. Mix in lamb, salt, and black pepper; cook and stir until lamb is lightly browned, 5 to 10 more minutes. Stir in tomato sauce and water; season with salt and black pepper. Bring lamb mixture to a boil and reduce heat to low. Simmer lamb in sauce until very tender, at least 1 hour, adding more water as needed. Stir occasionally. Stir okra into lamb mixture, adding more water if necessary, and bring to a boil. Spoon the bamia into a 2-quart baking dish and adjust salt and black pepper; cover dish with foil. 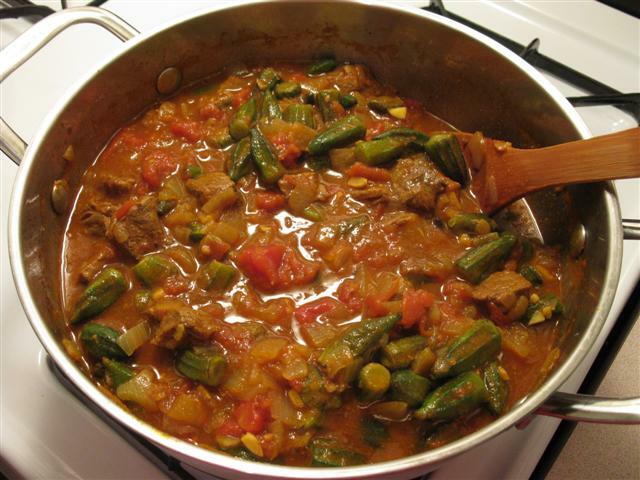 Bake in the preheated oven until okra is tender, about 45 minutes; uncover for last 10 minutes of baking.